Tonight on The Walking Dead…well, damn. That was devastating. 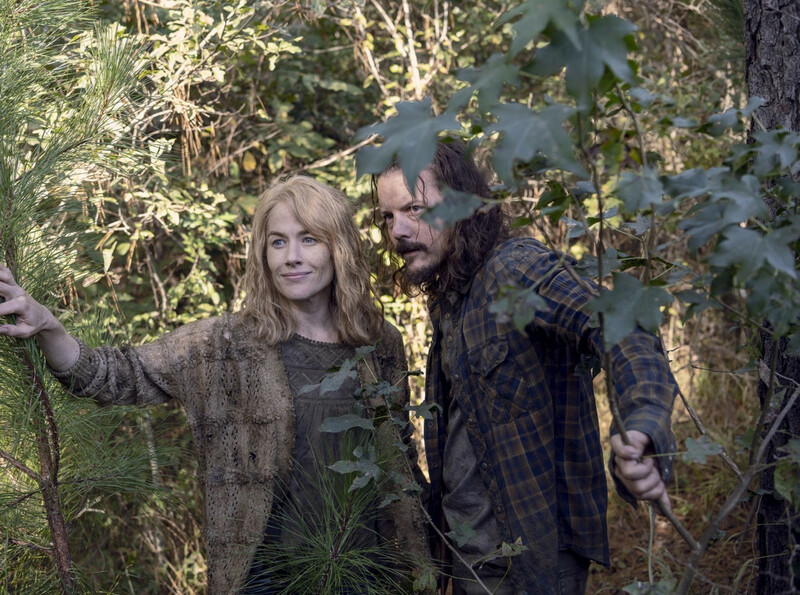 The plot: In the opening, we’re treated to a quick version of the story of Hilde and Miles, a couple who found Hilltop a few years back, and celebrate their anniversary as they leave for the fair, only to run off the road and killed by the Whisperers. Hilde is the one who carved the H tokens mentioned by Henry a few episodes back. We then get to the fair, which is lovely and light and full of hope, right down to the leaders of the four remaining communities signing the charter, and agreeing to a pact of mutual defense. 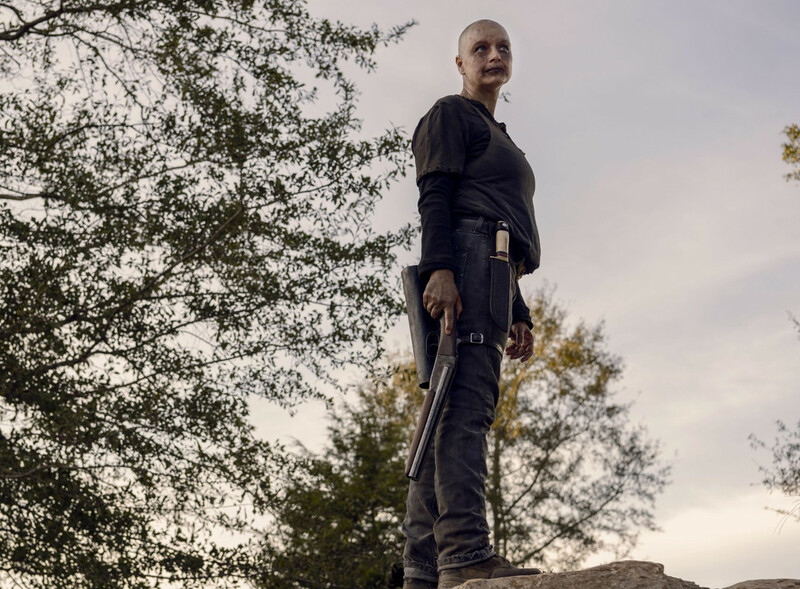 Knowing that trouble is likely coming from the Whisperers to Hilltop, they send out an early group to defend the town. 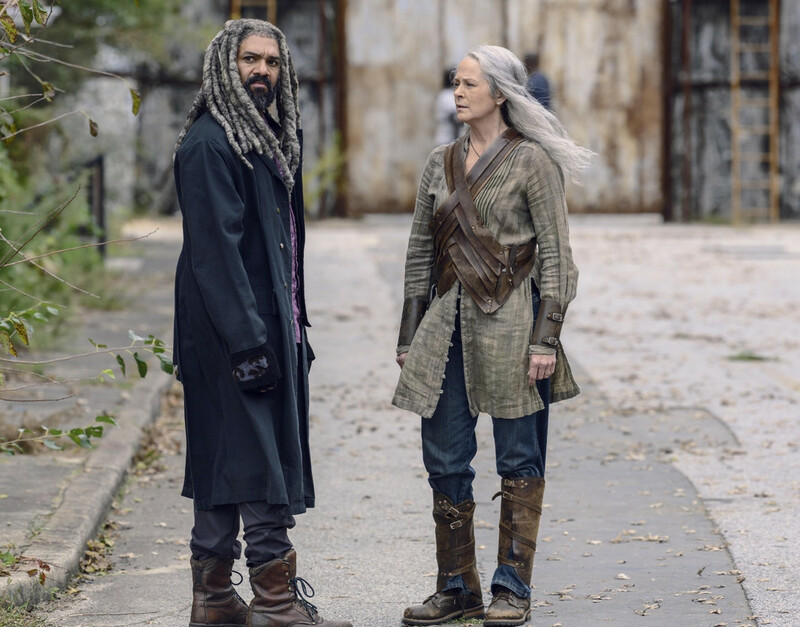 This group splits up when they find that turned over cart, and Carol, Daryl, Michonne, and Yumiko’s group run into walkers and the Whisperers, and are held hostage in the woods by the latter. 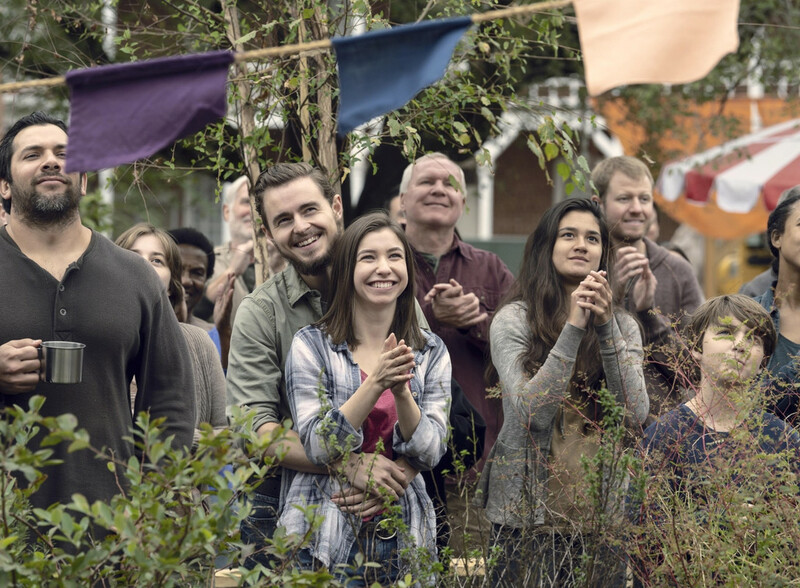 Meanwhile, pleasantries continue at the fair: Enid and Alden make it official, Rosita and Eugene reconnect as friends over radio parts, Tammy Rose and Earl discuss what to name the baby, the teens try to shake up Lydia, but Henry reassures her. Far more nefarious, however, is Alpha wearing Hilde’s dress, and hair, and prowling about the fair. She confronts Lydia during the movie, but Lydia makes it clear she wants her to leave and that she doesn’t want anyone else hurt, on either side. Unfortunately, as we soon learn through the other A-lister group’s eyes, it’s too late for that. 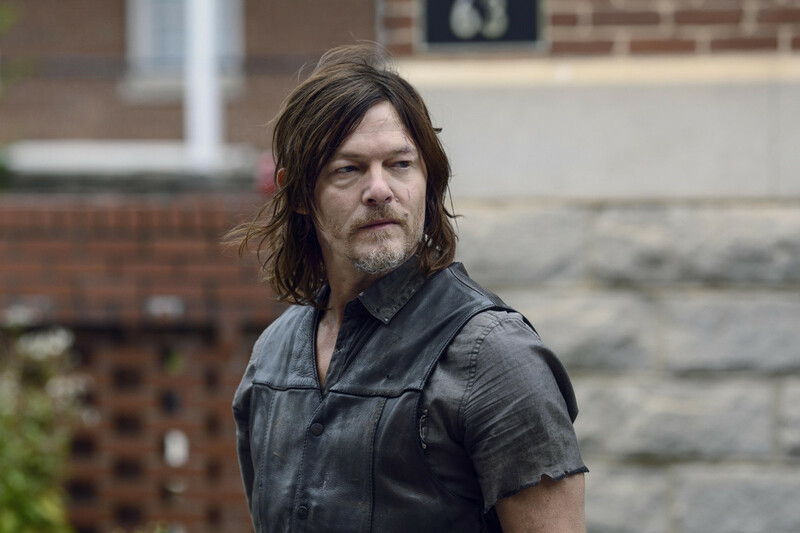 Alpha shows Daryl the enormous herd that includes and protects her people, and tells him what the boundaries of her land are–including a northern boundary that has been marked with the severed heads of their friends and family. In the aftermath, Siddiq tells of how they all tried to fight back together, and that their people died heroes. Lydia leaves her H-token necklace at the border, and she and Daryl turn back as snow begins to fall. The last time our band of heroes were cornered and surrounded in the woods by their enemies, everything changed. That time, Negan made his bombastic entrance and brutally slaughtered two of their own right in front of them. But Alpha is more simple and more cruel, and at least as dangerous, but in a very different way. This was more than just a horrible loss, this was a very calculated execution. When Hilde gives Miles the first H token in the opening story, they talk about what it means, and what it comes down to is hope. It’s just a trinket, a thing with no practical value, but it therein lies its value. It’s a trinket that could be made because there was a small corner of the world safe enough to allow for that kind of work and share it with others. It was a place where people came together to protect one another, to live, to raise children, to learn trades, to find friends and family. By the end of the episode, Alpha has killed a very specific group of people in order to kill their symbols and with it, their hope. She kills almost every teenager we’ve met–including, and especially, poor Henry. She’s even killed Enid, an up and coming doctor. She’s killed some of the Highwaymen, the latest group to become part of this community. She’s killed Tara, newly risen to a leadership position, and of the community that initially took Lydia from Alpha. She’s killed Tammy Rose, who was taking in the Whisperer baby. Some of these and the other people may be random, but many of these targets are very symbolic. They are signs of hope, slaughtered coldly and cruelly paraded before the people who loved them. Hell, even I teared up when I saw what had been done and to whom. I think the biggest surprise here was Henry’s death. True, he hadn’t impressed me a whole lot in the last half-season, but as I’ve said, I haven’t disliked him. In retrospect, this was set up kind of perfectly: Henry meant something to us because he meant something to Carol. He was, for the most part, a perfectly nice, normal, average teenager. He did some stupid things, but he did them with good and noble intentions. If anything, his being a completely normal teenager is exactly what makes this so tragic. 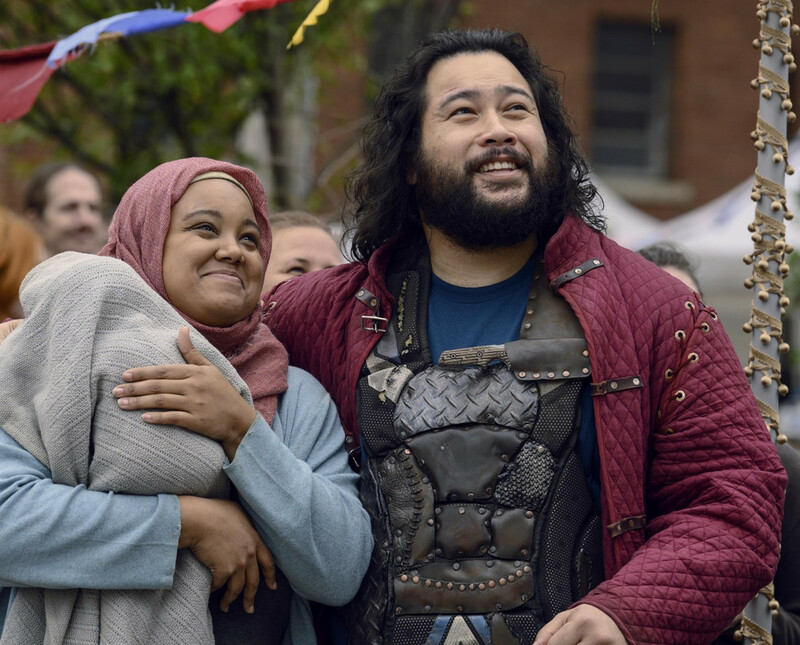 He was able to grow up to be that normal, to be a family with Carol and Ezekiel–not only giving him parents again, but giving Carol another child as well. Since we’ve seen her through her loss of Sophia, this was just so nice to see, to know she’d found safety and hope in her new life. And now we’re seeing that ripped away from her yet again and that is absolutely heartbreaking. Daryl trying to hurry to keep her from seeing her son’s head brought me right back to when Sophia staggered out of that barn and he grabbed her and held to keep her from running to her. Just…poor Carol. I only want good things for her and she keeps having to go through so much awful! The other hard hits, for me at least, are Tara and Enid. I really did not expect to see them on those pikes. The episode is chock full of conspicuous goodbyes between characters, too many to ignore the creeping feeling that some of them would indeed be permanent. But the show did a good job of throwing us off as to which ones really were. While I did know this was coming from having read the comics, I knew better than to expect it would be exactly the same, and sure enough, it was. Even more than I thought it would be. Enid, after all her hard-won survival and then finding new, real reasons to live and not just survive. And there’s some additional feeling of loss here because of how close she and Carl were, I think. Something about another piece of his lasting legacy dying like this makes it hit even harder. Tara just straight out shocked me! 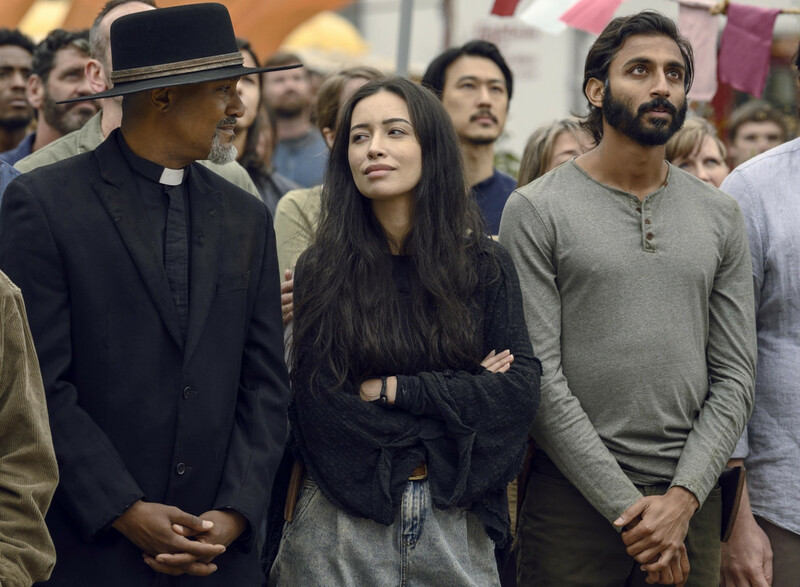 I fully expected she would keep leading Hilltop, and what with only recently having lost Jesus, she wasn’t on my radar at all. For that matter, who’s going to lead there now? But there was much more to enjoy in this episode than just this chilling final shot. The fair and everything in it was lovely–bright colors, sunshine, a silly cartoon movie. Game booths, displaying of wares, learning trade tips, a dunk tank with Eugene on the seat! Ezekiel’s touching speech at the opening, with the special nods to Rick, Carl, and Jesus. The signing of the charter, even if we all knew it was coming, was still touching and hopeful and an important moment in the story of these people and these communities. The classic Jerry moment when announcing the name of the fair! Oh, Jerry, I’m so relieved you’re still with us! The bonding moments that followed were just as lovely and touching, from Alden and Luke teaming up musically to Rosita and Eugene’s talk over the radio parts. I didn’t particularly care for the teenagers being dumb teens moment, but I see why they had it since most of them are dead by the end of the episode, they wanted to make sure we remembered who these people were. I did enjoy that Lydia wasn’t too shaken up by their antics, however, and that she and Henry were very clear on where they stood with one another (especially since that was their last moment together, it turns out). I also have to do a special shout out to the scene between Connie and Kelly. Without a word, this scene was emotive, genuine, and I loved it. We don’t often see a scene like this on TV, purely done in sign language, and I was incredibly impressed by it. And finally, there was Alpha creeping around the fair. Observing, absorbing, learning who these people are, their leaders, their weak spots, and of course, picking them off one by one. I doubt she was the only Whisperer there, to have managed to capture so many people, including some very experienced and expert fighters. I am glad they didn’t show us how that happened, or much of how they died in the end, because that would only have invited questions about how believable it was. Alpha has shown that she’s not to be underestimated in many ways tonight. Where Negan ran hot–hot temper, hot blooded–Alpha is the absolute zero opposite of him. She sheds tears for Lydia, yes, but at the same time, she’s almost shedding her last bit of humanity as she does. She isn’t seeking war, or to dominate, but she has been crossed and she’s making it clear now how much power she has to crush them if she’s pushed again. We’ve seen how much damage a herd that size can cause as it is, but with the Whisperers able to effectively control them? That’s a weapon the likes of which we haven’t seen. While Negan killed two people in a loud, bloody fashion to make his power play, she’s killed ten with no emotion and no showcase whatsoever. She’s literally drawn her line in the sand, and it’s got to be terrifying for the remaining survivors to contemplate what will happen if they cross that line. But there is a note of hope remaining in Siddiq’s speech. Once again, everything has changed, but while Alpha may have killed a lot of the hope in these communities, there is a spark of it left. There’s yet something she cannot kill, a warmth that her coldness cannot extinguish. Let’s see how well that hope holds up in next week’s finale! This episode was excellent. The bright hopeful parts, the creeping moments of foreboding, the emotional and visual callbacks to some of the most devastating and iconic moments in the past seasons, and that line of heads on pikes that will become yet another unforgettable moment in this show's history. 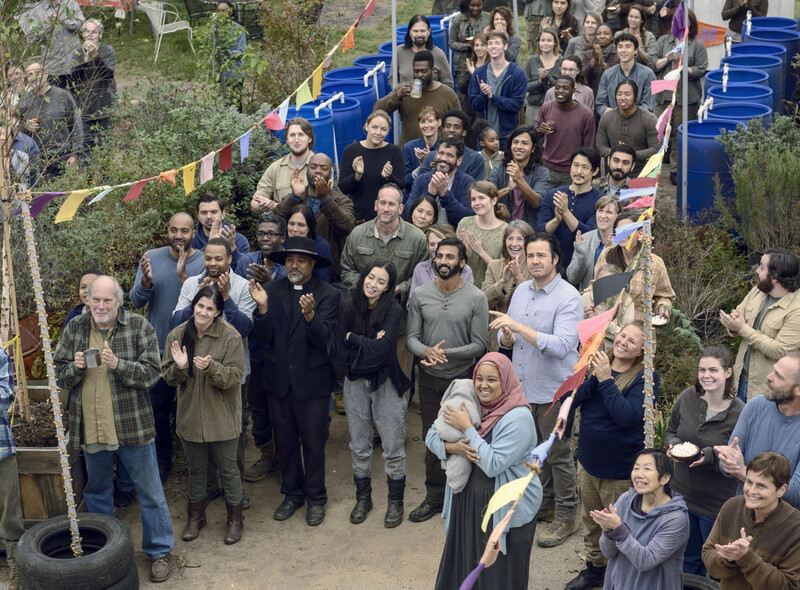 I'm sad to say goodbye to so many of these characters, and that's a testament to how much they've meant to me, and how much they mean to the characters still with us. My one complaint is that I wish the teens could've been made less annoying and typical, but that's barely a blip here, really. I'm excited, I'm heartbroken, I can't wait to see what's next. I'm torn between calling this a 9.5 and a 10, but in honor of all the amazing work from the actors for their characters who died tonight, let's make it official. You guys and gals earned it!